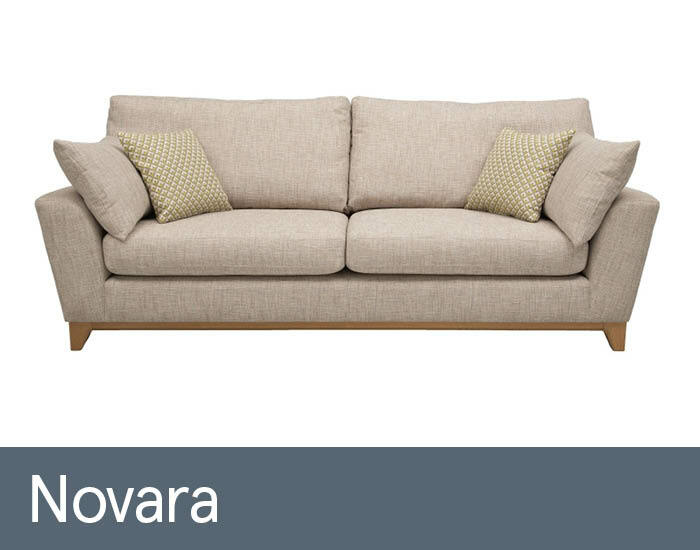 The Novara range is a classic range of sofas and chairs with a modern twist of character, boasting clean and contemporary lines with gently outward turning arms. Showcasing sumptuously upholstered in retro-esque colours, and modernised tapered pale oak legs in Ercol's signature style, that add a subtle modern character to your living room. With deep filled cushions and complimentary scatter cushions, filled with luxuriously soft duck feathers, Novara is guaranteed to offer comfort and support while relaxing. The grand sofa can seat up to 4 people comfortably, the large sofa can set up to 3 people, the medium sofa seats up to 2 people, the snuggler can seat up to 2 people snuggly and the arm chair provides great relaxation for one. The footstool is the perfect extra addition for comfort while relaxing. Available in a variety of sizes, from grand, medium and snuggler sofas to the armchair and footstool.